It’s been a while since The Movie Sleuth has explored and covered local homegrown Michigan Film venues, whether it be a mom-and-pop operation or a larger chain of theaters stemming from a single management company. I had never heard of the Farmington Civic Theater up until recently when it came up that a friend wanted to see the latest (and possibly last) Clint Eastwood film as leading actor-writer-director. 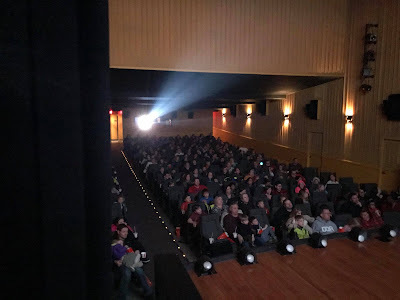 Located on Grand River Avenue in Downtown Farmington, Michigan, initially the small downtown theater sounded like the single screen movie house akin to the Elk Rapids Cinema or the Bijou by the Bay Theater on the precipice of Traverse Bay. While those expectations were mostly met, what I didn’t know going in was just how high the founders of the theater were aiming in its creation and just how far out it would branch itself out into the community with live shows onstage and right outside the main entrance of the theater itself! Founded in 1939 in a newly opened spot which was formerly the site of an abandoned A&P supermarket, the movie house was designed and constructed under the supervision of architect C. Howard Crane, the same man who oversaw the creation of Detroit’s Fox Theatre in a mutual Art Moderne style. With an attractive, tall neon-lit sign and a canopy over the front entrance, the Farmington Civic Theater boasted a large single screen with elegant stairwells leading to the upstairs balcony seating. The centerpiece of Downtown Farmington, Michigan, the ornate single movie house was managed by Edward Hohler who opened the theater in 1940 with the romantic comedy Hired Wife. 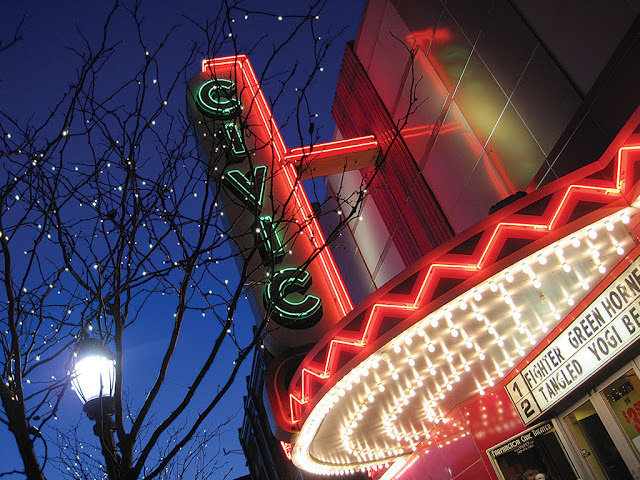 Eleven years later, Edward purchased the Farmington Civic Theater business ownership altogether before eventually bestowing the reins to son and manager Greg Hohler in 1973. In 1989, Hohler enlisted the help of architect Louise Wiltse who took to remodeling the balcony into a separate upstairs auditorium, making the once one-screen movie palace into a duplex. For the first time ever, the theater shut down for five weeks while the remodeling went underway. 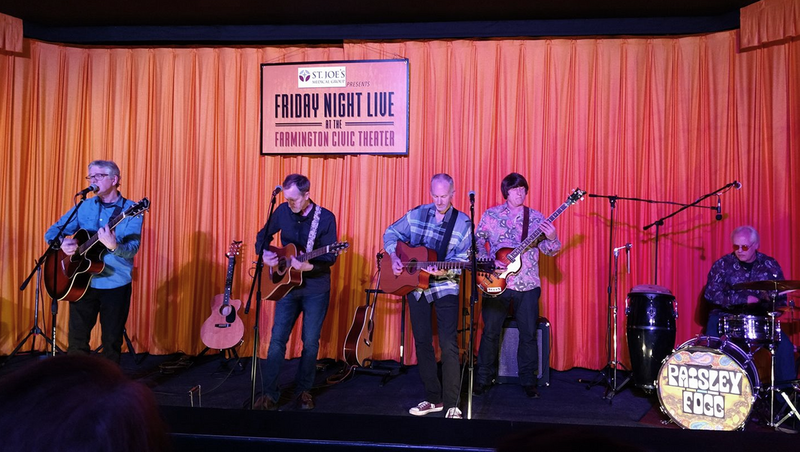 Ten years later, the City of Farmington purchased the building from Greg Hohler outright with a grand gala reopening, citing its cultural and historical significance to the community. Gradually the city, in keeping up with the demands of the movie business and the changing times, replaced their 35mm film projectors with digital projectors as well as upgrading the sound to Dolby Surround 7.1. To accommodate the technical upgrades, a new screen was installed upstairs along with new speakers. What sets the Farmington Civic Theater apart from the pack, however, has less to do with their movie screenings than their live concert performance events. Much like the Redford Theater, the Farmington Civic Theater alternates frequently between showing films and holding live musical acts on stage. Split into two separate events running monthly from September until April (sans December), the first concert event known as Friday Night Live sponsored by St. Joe’s Medical Group comprises a musical event in the upstairs stage auditorium showcasing singing-songwriting talents. The second and far more involving for the community is known as the Out Front, or street-performing or ‘busking’. Starting in 2016 during warm weather, the event features musical performers stationed outside the main entrance of the theater, giving passerby entertainment outdoors as well as adding a nice finishing touch to a moviegoer’s exit from the theater. Voted the ‘Best Movie Theater in Metro Detroit’ in from 2013 to 2018, the Farmington Civic Theater is a nice little venue steeped in Michigan history that remains a staple of the neighborhood and presents a welcome alternative to the big expensive multiplex theater scene. In conjunction with the theater, several neighboring restaurants in the area offer discounts to any patrons presenting their ticket stub, making the theater experience far more outreaching and involved in the immediate area than your average chain multiplex. That the theater branches out to involve the community with its unique blend of concert events both indoors and outdoors makes the venue a hotspot for a variety of entertainments cinematic and musical, projected and live on stage. Always eager to discover new or unchecked movie houses throughout Michigan, I was delighted by the Farmington Civic Theater and look forward to making my way back there soon!